Perfect to show just how much Grandma loves her little one. This 3 piece set includes a long-sleeve onesie, pants and a flowered headband. 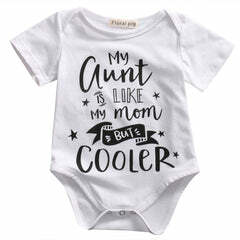 The plain white onesie has the words “Grandma Was Here” written on the front in large black letters, with loads of big red kisses all over it. The headband is white with black and red flowers and the shorts have a black and white floral pattern. Which makes it a picture-perfect outfit.